2018 Updated Information: Learn How To Take the Best Photos at Salar de Uyuni. Perspective or Reflective Photos – We’ll teach you how! With a little bit of pre-planning, your trip to Salar de Uyuni in Bolivia could result in some epic photos to share with your friends and family back home. 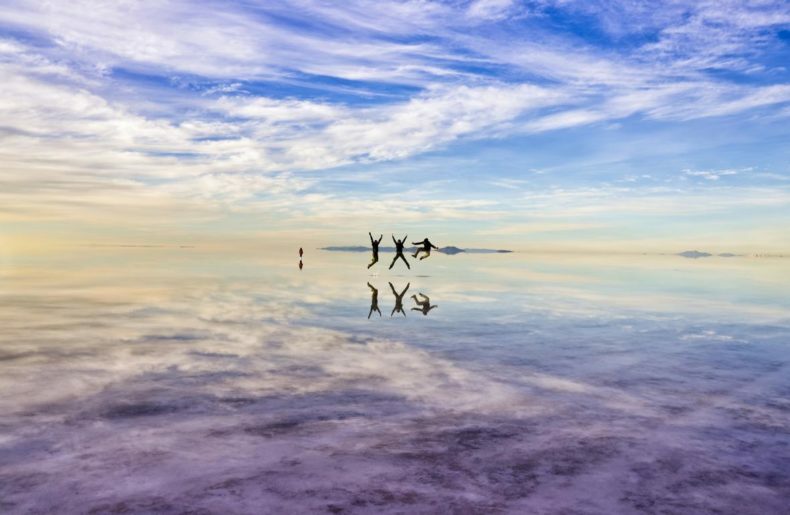 Let’s not lie, we all want that Instagram photo to brag that we are having the time of our lives… Here are our tips on how to take the best photos on the World’s Largest Reflecting Mirror – Salar de Uyuni. There are two very distinct seasons that make Salar de Uyuni look very different depending on when you go: the rainy season and the dry season. 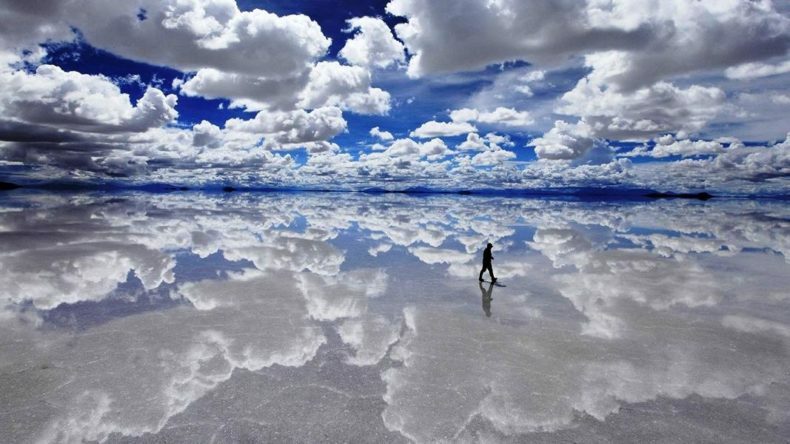 During the rainy season (January – April) the flats have a thin sheet of water that acts as the perfect reflection to the sky above. Just imagine taking a photo at sunrise/sunset…absolutely outstanding. Otherwise, during the dry season you have a gorgeous white plain of salt, which is absolutely perfect for taking perspective photos. 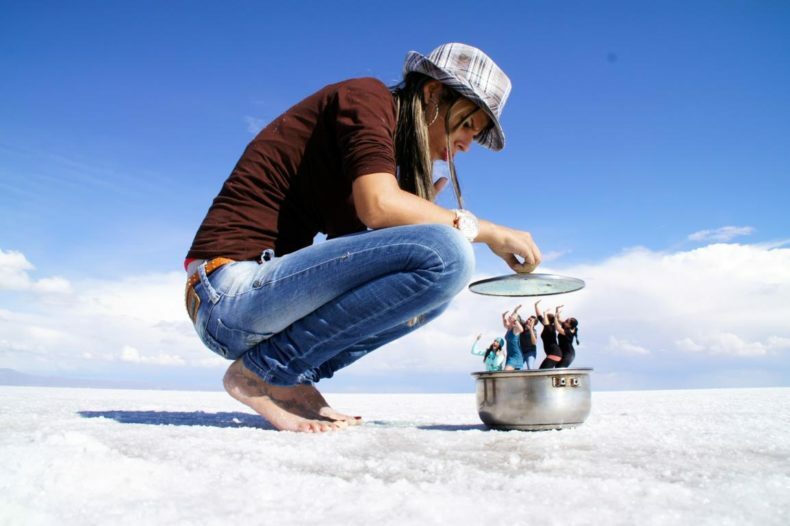 Below are some tips on how to take the best perspective photos on the salt flats in Bolivia. As stated before, the key to taking great photos while at the salt flats is all about the perspective. It is not as easy as taking out your camera and just pointing and shooting. The composition of the photo needs to be absolutely spot on. If not, the photo is worthless. It’s like taking a photo of the Eiffel Tower with your hand “supporting” it and completely missing where the tower actually is. First, you will need to decide what the focus of the photo is going to be. People V people or people V objects. Obviously the more subjects you have in your photo, the more difficult it will be to coordinate all of the subjects together. To make it simple, it is easiest to have only two objects/people. If you have room in your luggage, an easy way to get a great perspective photo at the salt flats is to bring small inanimate objects. For example, one of the most popular objects to bring is a toy dinosaur. Other good ideas include: Pringles can, utensils/bowls, or really any toy animal. It’s good to plan in advance, but any creative mind can think of anything in the spur of the moment! The best way to capture the best photo is to have one subject as close to the camera as possible. The other subject(s) need to be further in the distance so that they may appear that they are on top of/to the side/or descending into the distance. This is how you are going to create depth that deceives people’s perspective. It tricks their eyes into thinking something different. The photographer needs to be as close to the first subject as possible without cropping it out in any way. The photographer should not be afraid to get low to the ground or to do whatever it takes to get the shot. Most of the time people find themselves lying down on the salt. If you lay down, it creates the optimal level that sets the shot. If you take a photo from standing or even kneeling, it is harder to create the illusion that the subjects are on the same level. Dedication to the shot is key! Quick Tip: Experience the thrill of biking the Bolivia Death Road, one of the most dangerous roads in the world! Enjoy amazing scenery as you descend from high-altitude mountains to jungle landscapes. The photographer needs to have a steady hand. A tripod or a special camera mount may make things easier, but if you just make sure your hand is not shaking and missing the shot, you’ll be good. Take a lot photos because it is not easy getting the perfect positioning of all of the subjects. You definitely don’t want to leave and realize that you missed the shot later. In addition, when you take photos at the salt flats, you will be dealing with a lot of light. This is obviously better than no light. Just be aware of the shadows and always have the subjects facing towards the sun. If you have the subjects face away from the sun that is when you are going to get the lens flare – when the camera is pointed towards the sun. There are many amazing photos on social media that fellow travelers have already taken. 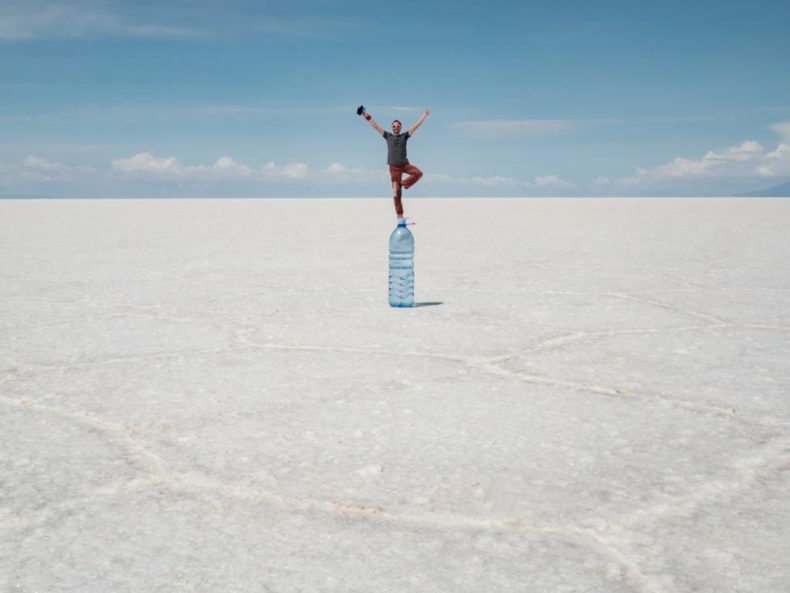 Get excited and get inspired for your trip to the Uyuni Salt Flats… just search on social media to get started! 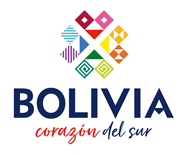 To book a tour in Bolivia we recommend you use FindLocalTrips.com a search and comparison website for tours across all of South America.